Rep. Alexandria Ocasio-Cortez has been taking a lot of heat from Republicans for proposing the Green New Deal. However, they have not really considered the vision this proposal lays out. Rather, they have chosen to mischaracterize it by saying people won’t be able fly in in airplanes, or eat beef, or drive their cars. However, if they actually read the bill that is being proposed, (found here), they would see that the bill faces the realities of climate change, economic disparity, and the shrinkage of the American middle class straight on. It also recognizes that a failure to urgently address these challenges and problems head on will only lead to further suffering and national decline for the vast majority of American citizens, not to mention millions of people around the world. Critics claim this is too comprehensive a program to enact, that it will cost a lot of money, and force people to change their habits of consumption. All of that is true. But given the direction our world is heading, what choice do we have but to change? 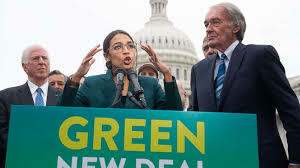 Rather than simply seeing the Green New Deal as a bill that can be voted up or down, I see it as a vision of where we need to go. Whether we achieve its goals in 10 years, 20 years or 50 years, failure to move in the direction this vision calls us will cause devastation and suffering beyond our comprehension. What is faced by the poorest American today in terms of economic security, health concerns and toxic environments will be faced by all but the few. Even the rich won’t be safe from toxic air and water. The opposition to the Green New Deal reminds of a story from the Hebrew Bible in Jeremiah 36. The prophet is instructed by God to write down all the things God has told Jeremiah needs to change in the nation of Judah to forestall the devastation that is coming. So with the help of his scribe, Baruch, Jeremiah fills a scroll with all of God’s warnings. 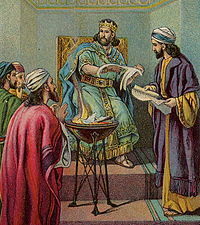 When the scroll is read to the king, Jehoiakim, the king rips up the scroll and sets in the fireplace. Even the king’s advisors were taken back by their leader’s intransigence. Three years later Jehoiakim was murdered when the Babylonians invaded, and the nation of Judah began 70 years of captivity. The Green New Deal is our scroll. We can take the words seriously, or repeat the error of so many tyrants, who think they are above the forces of nature and history. Rep. Alexandria Ocasio-Cortez and her allies have presented us a vision of what could be, and a way out and through a certain future of global warming and social unrest. lSome may criticize Ocasio-Cortez’s age and “lack of experience,” yet it has often been the young and “inexperienced” who wrought the most profound social changes in our society: a 26 year old preacher in Montgomery named King, a formerly incarcerated street kid named Malcolm, four college freshmen sitting down at a lunch counter, thousands of high school and college students opposing the Vietnam War, a 14 year old Afghan girl demanding education for women in her country, high school students from Florida demanding changes to gun laws after their school was shot up, and a 14 year old Swedish girl taking Fridays off from school to call attention to climate change. More than some of us old codgers, the young have a stake in the future. I think we should listen to them. The Green New Deal is a vision of where we need to go. Nay-sayers, climate change deniers, critics and scoffers, step aside. We need to move forward and quickly, we have got vision and we are moving toward it! Well the Democrats in the Senate had a chance to show how they are “moving forward”. How did that work out? If they really believed all that you are saying here they would have stood proud and voted for it. But alas…..